October is Domestic Violence Awareness Month and the SCPD is showing its support for victims during Domestic Violence Commemoration Day. October is Domestic Violence Awareness Month and the Suffolk County Police Department is showing its support for victims during Domestic Violence Commemoration Day. 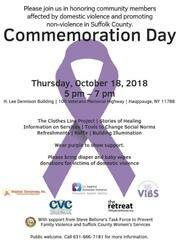 Several organizations will be coming together on Thursday, October 18 from 5 p.m. to 7 p.m. at the H. Lee Dennison Building in Hauppauge to educate the public and provide supplies to aid victims. Please join us in honoring community members affected by domestic violence and promoting non-violence.